Michelin engineers their latest light truck tires - the Defender LTX M/S - to tackle the rough stuff. We head to Vermont to experience Michelin's popular tire firsthand, now tagged with the company's Defender name. Vermont – Michelin sells an awful lot of tires in North America, especially in the light truck and SUV segment where the company holds a very strong position with both the major auto manufacturers (Michelin come as the OEM fitment on many vehicles in the marketplace) as well as with a growing customer base which tends to be very loyal to the brand. Set to debut at your local tire retailer is the latest version of the company’s popular LTX M/S tire, now tagged with the company’s Defender name in an effort to convey that this particular tire has been engineered to be very robust and ready to tackle almost anything that it encounters. The Defender line is also Michelin’s most popular family of tires, and the company offers a wide array of products under this banner suited for CUVs, SUVs, light trucks, and even passenger cars. The Michelin Defender LTX M/S has been designed for use on the majority of light truck and SUV models that now seemingly dominate our highways and byways, and it incorporates a variety of enhancements in an effort to ensure that it delivers a safe, efficient and comfortable ride on all surfaces, while remaining quiet enough to not interfere with the atmosphere of the passenger cabin. I recently had the opportunity to get behind the wheel of a couple of vehicles fitted with the new tire during a late summer visit to the scenic hills of Vermont. Michelin had a small fleet of 2012 Jeep Wrangler Rubicons on hand, as well as a smattering of loaded current model Grand Cherokees. The former are the foundation vehicles for the Michelin 4×4 Centre, a facility located near the ski town of Stowe, Vermont, where guests can learn the basics of operating a vehicle off-road so that they will have the knowledge to get the most from their vehicles as well as be better equipped to ensure safe operation in treacherous conditions. After spending the morning behind the wheel of both vehicle platforms on a wide range of mountain roads and at speeds that would represent the gamut of those typically encountered by consumers on a daily basis, our testing would transition to the mountains and a little off-road adventure. Our test loop comprised a carefully planned network of access and service roads on a local ski hill which the fine folks at Michelin had deemed challenging and technical enough to demonstrate the capabilities of the Defender LTX M/S tire. The terrain was rugged and drivers had to carefully navigate around, through and over a variety of obstacles such as rocks, roots and logs, as well as face ever-changing surface materials like sand, gravel, shale and mud. The Defender proved capable enough to tackle everything with relative ease, which is particularly impressive as this popular light truck tire line is primarily intended for use as a daily use street and highway tire. Defender series EverTread – what it is? The goal for the Defender series of tires is to offer exceptional toughness and durability, so Michelin’s engineers have developed an advanced tread compound they refer to as ‘EverTread’. EverTread has been designed to hold up longer in tough conditions while delivering competent performance in all seasons, and improved fuel efficiency. Over the course of our test day on the mountain a small army of off-road driving instructors lead our dusty convoy through a mixture of technical trails that were strewn with jagged rocks, steep drops, and deep tire pinching ruts. In short, the potential of piercing a hole in a sidewall or blistering the tire was always present. Add to this a predominance of slick and slippery low-traction surfaces and you have a recipe for disaster in the making. I am happy to report that all of the vehicles made it to the summit, as well as back to the staging area at the base of the mountain without a single malady. No one got stuck, and the tires held up despite the efforts of the automotive journalists in attendance to test the mettle of Michelin’s latest tire design. During my time behind the wheel I came away impressed by ability of the tire to find effective traction despite the fact that the compound is a little harder than that of a traditional dedicated off-road tire, and the fact that the tread pattern is more street specific than rock crawler. There was a minor tendency for the tire to slip laterally over really slick rocks when the going got steep, but its effect wasn’t substantial enough to sap my confidence in the tire’s dynamic handling capabilities. the Defender LTX (is) a great choice for the tradesman, farmer or recreational user who needs to know that the tire will be durable enough to handle rough trails, hazardous construction sites, and venturing off the beaten path. Close inspection of the tires on the various test vehicles revealed that the tires fared well against the ravages of the mountain environment, and there was very little build up of mud or debris in the tread. The narrow grooves did seem more prone to trapping small stones than a chunky off-road fitment would, and during our time running on pavement I could hear the signature click-clack of pebbles that had become lodged deep in the tread. Back on the pavement the Defender LTX M/S proved extremely quiet and stable, and as a result, overall ride quality was exceptional. The Defender LTX has been designed so that it has the ability to handle occasional off-road duty while managing to maintain the inherent properties the consumer looks for in a premium all-season street tire. 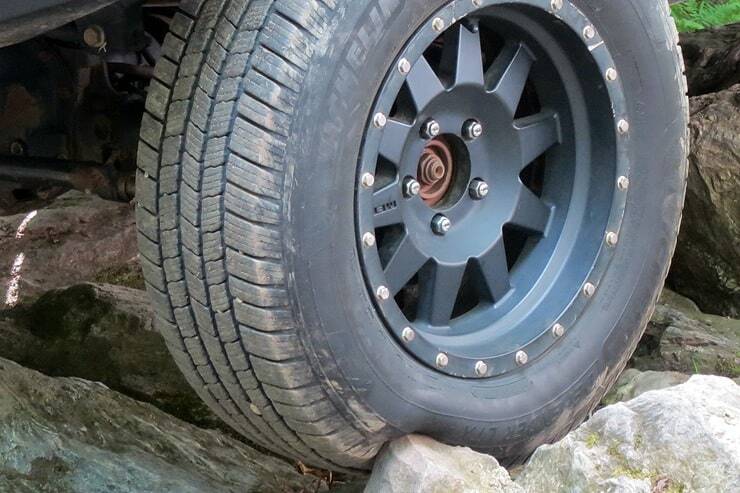 This makes the Defender LTX a great choice for the tradesman, farmer or recreational user who needs to know that the tire will be durable enough to handle rough trails, hazardous construction sites, and venturing off the beaten path. The Defender LTX represents an evolution of the company’s previous design, but this latest variant has been reengineered to be stronger and more durable in response to the fact that the latest light truck offerings are producing increased amounts of torque. Michelin was faced with the problem of consumers expecting a tire to last for 50-60,000 kilometres despite the fact that the engine in their vehicle was capable of delivering prodigious amounts of tire-shredding torque (some as high as 900 footy-pounds). The solution to this problem was to incorporate the company’s new EverTread compound, as well as to strengthen the construction of the tire’s sidewalls. Apparently this potent combination, as well as a number of other improvements give this new-generation Defender the capabilities Michelin engineers were seeking, without compromising overall ride quality. Michelin has conducted an extensive testing program for the Defender and results have revealed that the tread lasts 10-percent longer than its predecessor and due to improved traction it is able to bring a vehicle to a stop more quickly, and requires 10 metres less to do so (from 80 km/h). Michelin subjected these tires to endurance trials over 3,000 kilometres of treacherous gravel roads in Spain to demonstrate the quality of the new tire’s construction. It was revealed that the Defender LTX was able to resist the cutting and chunking of its tread blocks, even when faced with long periods of operation over sharp rocks and irregular surfaces. Michelin’s marketing materials refer to the construction of this tire as being MaxTough – meaning it has been designed to be durable and long lasting. The contact patch of the Defender LTX has been designed to maximize contact with the road surface, which helps ensure that the forces of acceleration, braking and cornering are distributed as evenly as possible. Michelin dealers will be offering the Defender LTX lineup of tires in 23 popular sizes beginning this month, and additional sizes will follow as production ramps up in the next few months. The Defender LTX M/S carries an 80,000 to 115,000-kilometre warranty, which shows that Michelin has a great deal of faith in this product.